Keep refrigerated at 0ºC to 4ºC until ready to use. Refrigerate after opening and use within two days of opening. This product is fully prepared and ready for you to enjoy. There are two methods of making smoked fish, by cold smoking and by hot smoking. Cold smoking means curing fish by smoking at an air temperature not higher than 33°C. Hot smoking means curing fish by smoking at a temperature of 70-80°C at some stage in the process in order to cook the flesh. 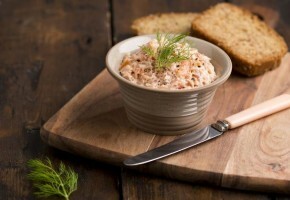 Hot smoked fish products do not require further cooking before consumption.